At Santa Rosa Family Dentistry, our compassionate dentists have decades of combined experience and have won over generations of families with their commitment to practicing today’s dentistry with yesterday’s values. If you’re looking for a knowledgeable and friendly-friendly dental care in Gulf Breeze, FL, schedule your next appointment with Santa Rosa Family Dentistry. Creating lifelong healthy smiles starts with an early introduction to dental care. At our Gulf Breeze family dental practice, Dr. Paul Quinlan and Dr. Gina Gomez happily welcome children ages 3 and up and take extraordinary measures to earn their trust. Our kid-friendly office features a separate waiting room for children that is decked out with beanbag chairs, toys, and video games. We believe that creating a fun environment and treating children in a gentle, friendly manner helps them feel safe visiting the dentist and prevents dental fears later in life. When children see us every six months for an exam and professional cleaning, their dental visits become so routine that they won’t be afraid even if they need a filling or other restorative procedure. Also, picking out a prize from our toy chest and getting a T-shirt for a good checkup always helps children ease their way into regular dental care. 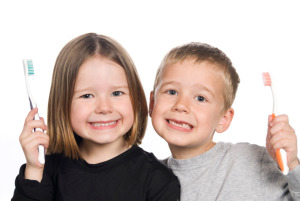 Your Gulf Breeze family dentists place great value on oral health education, which begins with teaching our youngest patients and their parents how to keep teeth and gums healthy with a proper diet, good at-home oral care and preventive procedures such as fluoride treatments and dental sealants. Comprehensive education and preventive care remain an important part of oral health care at every age. Adult patients visiting Santa Rosa Family Dentistry for routine exams and cleanings also receive extensive education on the importance of preventing oral health problems, especially when it comes to gum disease. While this condition is incurable, the progression of gum disease can be halted and its symptoms treated effectively. Without treatment, periodontal disease can cause tooth loss and lead to or worsen serious health conditions such as cardiovascular disease and diabetes. As with most dental health issues, you’re better off preventing gum disease in the first place than seeing your dentists in Gulf Breeze frequently for treatments, and we’re happy to educate you on how to do that. Whether we’re treating children, parents, or grandparents, one of our biggest concerns is helping patients retain their natural teeth for life. While there are several effective tooth replacement methods, nothing is as strong or stable as natural tooth structure, and that is why we always strive to avoid extracting decayed or damaged teeth. The modern dental tools, techniques, and restorations we use are designed to preserve as much healthy tooth structure as possible for good functionality and lasting results. This includes performing root canal therapy instead of an extraction and placing a filling, inlay or onlay when possible rather than a crown, which requires more tooth reduction. Call Santa Rosa Family Dentistry of Gulf Breeze today! The experienced team at Santa Rosa Family Dentistry looks forward to giving all members of your family the personalized care that they deserve. Contact us if you would like to schedule appointments for you and your family today!